Cruises offer a variety of packages for newlyweds on their first honeymoon or for those who are taking a second honeymoon to commemorate their anniversary. Choosing to have your honeymoon at sea can be a hassle-free and relaxing way to spend the first few days or weeks of married life or to celebrate a milestone in your relationship. Carnival Cruise Lines has a wide variety of ships and packages for newly married couples. What makes this cruise special is that they offer a registry for your guests, and guests can purchase upgrades to bigger suites, spa days and special dinners. The newer ships offer flex-dining and other dining locations for couples to have a more private dinner. Carnival Cruises go to a many locales, so there are plenty of destinations to choose from. The Celebrity Cruise line is known for its elegance and sophisticated atmosphere. Celebrity Cruises offers a variety of rooms that come with different benefits. For example, the AquaSpa cabin offers in-room wellness amenities as well as priority access to the spa and the fine dining restaurant on board. Celebrity Cruises has evening celebrations for newlyweds via an invitation featuring hors d'oeuvres, special champagne and mingling with the ship officers. "Celebrity's signature honeymoon packages include breakfast in bed, a bottle of Mumm's Champagne with two engraved glasses, flowers, plush cotton bathrobes and candy for about $180," according to Cruise Critic. Celebrity travels to some of Europe's most romantic cities, so finding a romantic destination is no problem. Costa Cruise is an Italian line that boasts all the luxuries of European style. There is regional cuisine, a dance club on board and some of the most luxurious and expensive spas on a cruise ship. "Couples can purchase the Honeymoon Package for $169, which includes two keepsake bathrobes, a bottle of sparkling wine, a floral arrangement, a photo portrait and a 'Certificate of Love' signed by the ship's captain," according to Cruise Critic. Much like the reception on Celebrity Cruise lines, Costa offers a cocktail party for newlyweds. A possible drawback of this cruise line is that it follows European customs, which means a lot of smoking, late dinners and more a la carte pricing. 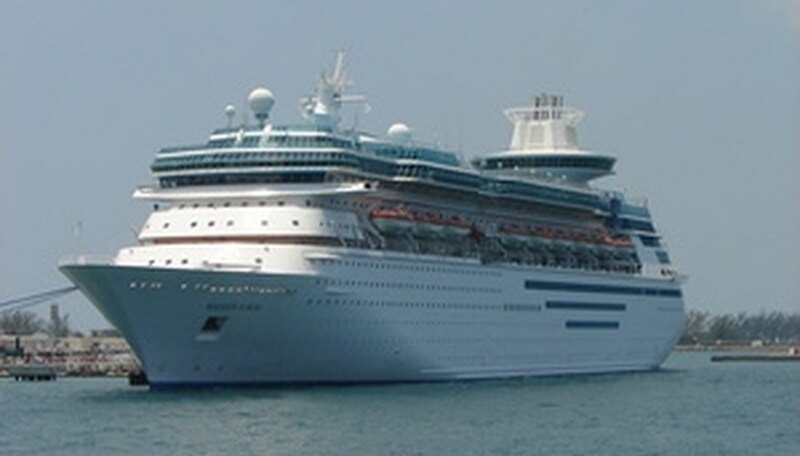 Royal Caribbean offers adventure cruises for the couple who likes the more active lifestyle. Though it is a more adventurous line, there is no lack of romance aboard. Couple have a wide variety of romance packages to choose from, ranging in price from $100 to about $800. The Classic Romance package includes a bottle of Domaine Chandon sparking wine, hors d'oeuvres and after-dinner sweets for the first formal night, as well as an 8-inch by 10-inch portrait in a silver frame. There are also the more expensive Grand Romance and Grand Romance II packages, which include flowers, robes and spa treatments. A possible drawback to this cruise line is that it is a popular family cruise, so choose your sail time wisely and avoid school breaks for a much more romantic and adult cruise. Catherine Roebuck started writing in 2007 and has been published in several Ohio University publications, such as Compass and The Ohio Journalist. Roebuck graduated with a Bachelor of Science in journalism from the E.W. Scripps School of Journalism at Ohio University. Roebuck, Catherine. "Romantic Honeymoon Cruises." Dating Tips - Match.com, https://datingtips.match.com/romantic-honeymoon-cruises-7276790.html. Accessed 18 April 2019.